St. Rupert was the bishop of the German city of Worms. He was sent to today′s Austria in the late 7th century as a missionary. He discovered a settlement in the ruined city of Iuvavum, probably a community of Romano-Celtic Christians, by the River Salzach. Here he founded his ′headquarter′, alongside with St. Peter′s Abbey. His sister St. Erentrudis founded the Salzberg nunnery of Nonnberg. Alongside with his successor St. Virgil, Rupert is the patron saint of Salzberg. 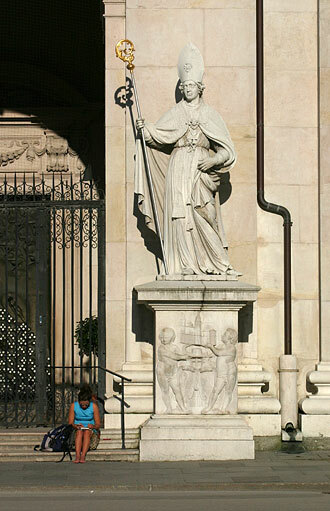 This statue in front of the Salzburger Dom Cathedral gets incorporated into the play ′Jedermann′ during the Salzberg Festival - usually, it is ′only′ a tourist attraction, though.